The two major components of an HVAC system are the condenser and evaporator. The condenser is made up of the compressor, condenser coil and condenser fan. The compressor is often called the heart of the system because it moves the refrigerant from the evaporator to the condenser and back to the evaporator. The condenser coil takes the heat from the refrigerant and transfers the unwanted heat to an outside medium like air or water and this is aided by the condenser fan blowing across the coil. The evaporator includes the evaporator coil, blower assembly and metering device. The evaporator coil absorbs the heat and moisture out of the indoor air. 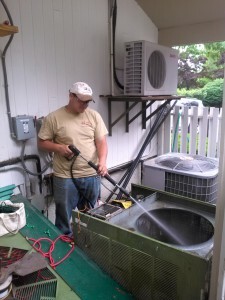 The blower assembly pulls the air from within the space across the evaporator coil and then returns the conditioned air to the space being serviced. The metering device acts as a restriction in the system to make sure the refrigerant flows at the proper rate so that it does not go back to the compressor in a liquid state. It is very important that both of these coils are clean so that they can work at peak efficiency. To help keep the evaporator coil clean it is important to have regular filter changes with a quality pleated filter. The condenser coil is exposed to the elements so it needs to be sprayed with coil cleaner and power washed to keep pollen and other outside items out of the coil. A good preventative maintenance program will help you keep your equipment running efficiently which will save you money with lower energy usage.